So here’s an interesting topic: Movies based on poems. Yes, they exist. It seems they are few and far between, but a little digging reveals a few prime examples. Of course most that spring to mind live in the epic poem category, but I’m going to go ahead and disqualify those right at the outset. An epic poem is, for all intents and purposes, basically a book. And a book-length work, regardless of its rhyme and meter, ought to contain more than enough plot to fill out a feature film. So, while they may be great movies, don’t give me your Troy (the Iliad), your Beowulf (Beowulf), your El Cid (Cantar de Mio Cid) or your Braveheart (The Actes and Deidis of the Illustre and Vallyeant Campioun Schir William Wallace). 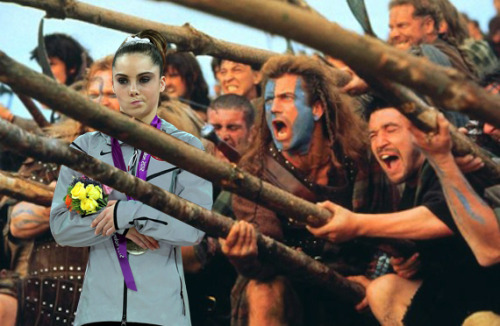 Neither McKayla nor I am impressed. Also, spare me the modern retellings like “O, Brother Where Art Thou” (the Oddysey) and the biopics like “Howl” (“Howl.”)- both of which are already disqualified based on length above. “The Man From Snowy River,” based on the 1890 poem of the same name, by Australian poet Banjo Paterson. The climax of the poem became the climax of the film- Jim Craig’s lunatic plunge down that impossibly steep gorge on horseback was seared into my five-year-old brain like few movie moments have been before or since. “Gunga Din,” based on the 1892 poem of the same name, by Nobel Laureate Rudyard Kipling. This one’s a “loosely-based,” but the theme of the brave and decent native as compared to the craven British soldiers is true to the original. “The Raven,” based on the 1845 poem of the same name, by drunkard and all-around wierdo Edgar Allen Poe. I haven’t seen this one, so I don’t know how loyal it is to Poe, but it’s a B movie horror-comedy. What more could you really want? “Mulan,” based on “The Ballad of Mulan” a Chinese poem transcribed in the 6th century. I haven’t read this one, and haven’t seen the movie. But I did read the Chick-Fil-A kids meal version to my kids a year or so ago. Does that count? Which ones did I leave out, readers and movie buffs? What other short poems have made their way to the silver screen? Desperate and determined to rescue his son at all costs, he makes a deal with the U.S. I heard that the the iPad mini 5 will sport a 7000-series aluminum chassis which is different to the one's previously used. The device will feature 8-megapixles camera in the rear and a 1.2-megapixels camera. While I'm very eager for the iPad Mini 5 to launch, I've heard that the the tab could be renamed as Apple iPad Mini Pro. Is this true?